For all occasions in love and life, you’ll find a breathtaking collection of exquisite diamonds, jewellery and designer gifts. Ernest Jones is firmly established as the UK’s diamond and watch specialists, with 180 stores stocking prestigious brands such as Omega, TAG Heuer, Breitling, Gucci, Chanel, Cartier, Raymond Weil and Longines. The balance on this eGift Card may be used for purchases in full or part payment for any item available in store or online. 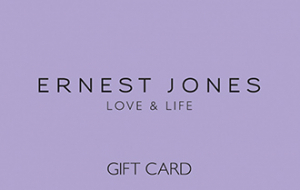 Online: Visit www.ernestjones.co.uk for online purchases and enter your eGift Card number and pin on the Payment Details page at the checkout. In store: Prior to your purchase, at the till, please present your eGift Card either on your smartphone or as a print out. Both online and in store: Please use additional payment methods for any outstanding balances on purchase. TERMS AND CONDITIONS: Please look after your valuable gift carefully and treat it just like cash. The amount redeemed from an eGift Card will be shown on the till receipt for each in store transaction. No change will be given but the balance may be applied to future purchases. Keep your eGift Card secure and bring with you when returning any items purchased. Ernest Jones reserves the right to amend these Terms and Conditions from time to time, to view the full Terms and Conditions, click here. EXPIRATION DATE: Cards expire after 24 months of non consecutive use and remaining balance will be deducted.